We know that emitting carbon dioxide into the atmosphere causes climate change. We also know that climate change is causing damage, and that it will cause even greater damage in the future. But how much damage? Can anybody put a dollar sign on the cost? That is just what a group called the Interagency Working Group on Social Cost of Carbon (IWGSCGG) tries to do. The task is especially difficult because the damage caused by carbon dioxide does not occur when it is first emitted. Carbon dioxide remains in the atmosphere for 80-100 years, and it continues to cause global warming the whole time it is there. The damages from carbon dioxide emitted today will continue to accrue over the entire 80-100 years. As the concentration of carbon dioxide in the atmosphere continues to rise, climate change will accelerate, and the damage it causes will increase. Thus, a metric ton of carbon dioxide emitted in 2050 is expected to cause more damage than a ton emitted in 2010. First the numbers, then some background on what it means. The IWGSCGG uses several different methods to estimate the future costs of carbon emissions. Then they average the estimates and adjust them for inflation back to 2007 dollars. In calculations of this sort, the assumed inflation rate often has a large effect on the outcome. 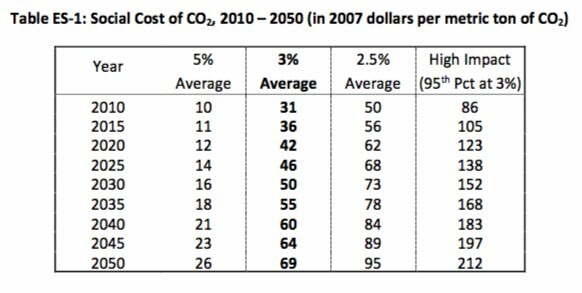 In Table 1, the left column represents years in which a ton of CO2 might be emitted. The next three columns each assume a different inflation rate. The column on the far right represents similar information as the 3.0% Discount Average column, except instead of taking the average damage cost estimate, they took the 95th percentile. The idea is that, if inflation is 3.0%, the odds are 95% that the cost of the damage will be no higher than the values in this column. The most plausible estimate of the damage caused by each metric ton of carbon dioxide emitted into the atmosphere in 2010 is $31. The damage caused by each metric ton emitted in 2015 is $36, and for each metric ton emitted in 2020 it will be $42, and for each metric ton emitted 2050 it will be $69. Compared to estimates made in 2013, the damages are estimated to be 1-2 dollars less per metric ton. In 2010, the United States emitted an estimated 5,736.4 million metric tons of CO2. At $32 per metric ton, that equates to $183.6 billion. The GDP of the United States in 2010 was $14,958 billion, so the damage is roughly equal to 1.2% of our total economic output. Why is this estimate important? Policy makers need to analyze the costs and benefits of the programs they mandate. Avoided future damage is a significant benefit, so they need to estimate how much future cost is avoided. The report suggests that the United States could spend up to $183.6 billion per year to reduce CO2 emissions, and be paid back by the damage prevented. This report is an update of the second IWGSCGG report, issued in 2013. The cost estimates changed between reports because of increased knowledge about climate change and improvements in the computer models used to make the estimates. There is still considerable uncertainty here, but the IWGSCGG estimate may be the best estimate available. Interagency Working Group on Social Cost of Greenhouse Gases. 2016. Technical Support Document: – Technical Update of the Social Cost of Carbon for Regulatory Impact Analysis – Under Executive Order 12866. Downloaded 3/20/2018 from https://19january2017snapshot.epa.gov/sites/production/files/2016-12/documents/sc_co2_tsd_august_2016.pdf. For U.S. greenhouse gas emissions: EPA > Climate Change > Emissions > National Data, http://www.epa.gov/climatechange/ghgemissions/usinventoryreport.html. For U.S. GDP: Bureau of Economic Analysis > National Economic Accounts > Current Dollar and “Real” GDP (Excel Spreadsheet). http://www.bea.gov/national/index.htm#gdp. By mogreenstats in Climate Change, Greenhouse Gas Emissions on 2018/03/22 .